I always say if you can’t eat it, it has no business going on your skin, hair, nails or in your home environment. Playing detective with people’s health has been my job for the past eight years. People don’t just “get sick.” Illness is created, slowly. Illness is cumulative. I have found that toxicity is one of the main contributors to disease. Sure, toxins are in the food we eat and switching to organic, chemical-free options is a no-brainer, but it goes so much deeper than that. When we look at ingesting toxins, the body’s inner wisdom protects us. For example, in the intestine, predigested food moves over the villi (little finger-like receptors) and these villi decide if the nutrition will move to the blood stream to become the body, to the bowel as waste, or to the fat cells as toxins, where they stay safe until the fat cells become so engorged with toxins that the toxicity gets released into the blood stream , causing illness. Or, the toxins stay there until the fat cells get so full of fat that the fat pushes the toxins out into the body. Either way, it’s not so great. Still, there is an even worse fate! That is if the toxicity gets absorbed right away through inhalation. This can happen via “off-gassing” from furniture, flame retardant-treated rugs, paint, household cleaning supplies, hair spray etc., and absorbs directly through the skin, as in the case of personal care items (makeup, body products, deodorant, hair products, etc.). What can you do to stop toxins from coming in? Do a swap-out! Simply choose healthier versions of items you already use. Green Beauty Team is a wonderful resource for discovering great makeup and self-care items to replace the toxic ones. It is a process that took me about two years. When transitioning to greener products, you may find some don’t work as well. It’s all about trial-and-error. For me, finding non-toxic nail polish that wore well through cooking and dish washing was a challenge. 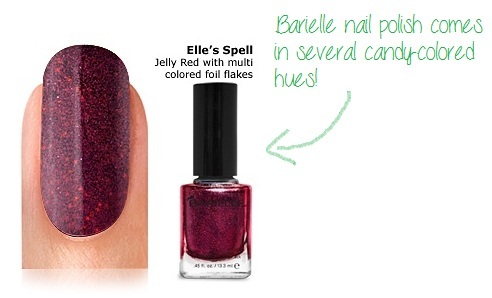 During a visit to a nail salon, the technician used Barielle — a non-toxic polish in punchy, fun colors — and I was hooked. Don’t stop at makeup and skincare! Household cleaners are filled with harsh chemicals. Baking soda works in lieu of chemical-ridden scrubs, but my all-time favorite discovery has been essential oils, such as lavender, lemongrass, sweet orange, peppermint, cedar wood and ylang-ylang, which I put a few drops of in hot water and scrub surfaces and floors. The smell is amazing and I know I’m not going to die. These are very simple changes that will truly keep you safe. It might take some time to transition, but I feel confident that you can find items that are just as good, if not better than, the commercial ones.